Charlottenborg in Copenhagen is Denmark's first baroque palace. The three-wing building was built at the beginning of the 1670s by Norway's governor, Ulrik Frederik Gyldenløve. He was half-brother of Denmark's reigning King Christian V. Gyldenløve hired Dutch-born Ewert Janssen as architect. Charlottenborg's fourth wing was added in 1682-3, with Master Builder General Lambert van Haven as architect. The palace adjoins a square that from 1688 was known as Kongens Nytorv featuring A.C. Lamoureux's equestrian statue of the king. In 1700, Queen Dowager Charlotte Amalie moved into the palace, which was named after her. 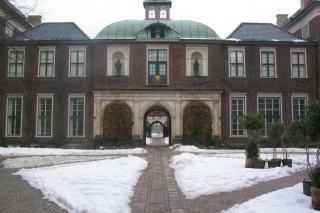 From 1754, Charlottenborg has formed the setting for The Royal Danish Academy of Fine Arts. Already in 1805, The Royal Danish Academy of Fine Arts in Copenhagen had appointed sculptor Bertel Thorvaldsen (1770-1844) as professor. But Thorvaldsen had preferred living in Rome since 1797, where he had gradually achieved global recognition. He had made busts of numerous travellers, and customers clamoured to buy his classical figures and groups of sculptures. Thorvaldsen remained in Italy except for a brief stay in Copenhagen in 1819. Not until 1838 did the Danes finally manage to entice the sculptor back to Copenhagen. To mark the occasion, he was made a freeman of the city. The art professor called The Academy his home until 1844. Sadly, in March of that year he met his end sitting on his free seat in the comedy house on Kongens Nytorv.